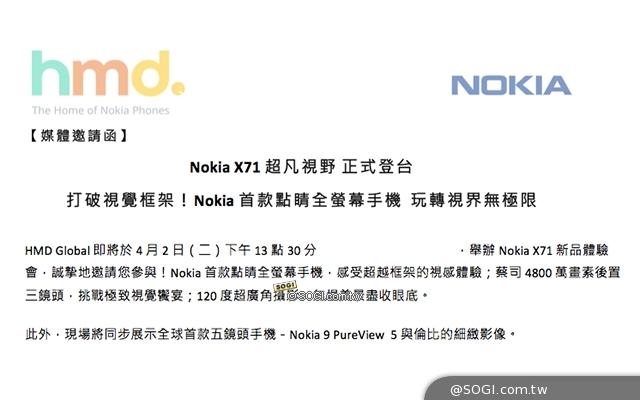 As per the latest info coming from Taiwan, Nokia Mobile will soon announce a new smartphone in the country. Nokia Mobile has already sent out media invites in Taiwan and it reveals a lot of exciting info about the upcoming new Nokia smartphone. As per the invite, Nokia X71 will come with three cameras where one is a 48MP sensor and the other will be a wide angle camera with 120 degrees super wide angle lens. The invite mentions three cameras but has no information about the 3rd camera which could just be a reference to the front-facing camera. The invite also reveals that the Nokia X71 will be the first Nokia smartphone to come with a full-screen display. This could be a hint towards a smartphone with a punch hole display which we saw in the renders earlier. Nokia Mobile will announce the Nokia X71 in Taiwan along with the Nokia 9 PureView on 2nd April and the event will begin at 13:30PM Taiwan Time.